The region of Valparaíso just north of the Santiago Metropolitan Region has a landscape of mountains and broad valleys, covered with farmlands, vineyards, and wine distilleries. Avocados and flowers are cultivated in its fields and along irrigated slopes. The region marks the division between the drier northern climate and the more Mediterranean climate of the RMS and the rest of central Chile. There are also some heavy industries here. Copper ore mining, cement production and oil refining are some of Valparaíso's main industrial activities. The capital, Valparaíso, is a major cultural and political hub and the country's main port. In recent years, Valparaíso has developed a new regional metro system, connecting it to Santiago. 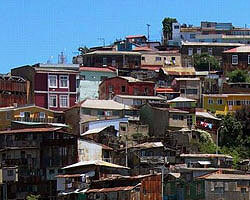 Valparaíso is one of Chile's most populous regions. Apart from the capital, there are 8 other communes that make up this region: Viña del Mar, Quilpué, Villa Alemana, Concón, Quintero, Puchuncaví, Casablanca and Juan Fernández. A UNESCO World Heritage Site, Valparaíso is a colourful city whose beauty has inspired writers, musicians and architects through the ages. Known to Pablo Neruda as "the ocean's sweetheart", Valparaíso has also been called "Little San Francisco" or "The Jewel of the Pacific" by seamen docking in its harbour. Valparaíso is a major historic seaport and thanks to the convergence of people from different nations has contributed to Chile's cultural heritage a wonderfully eclectic blend of architectural styles. Some fascinating properties can be found in this delightful city, which has many interesting old buildings. Valparaíso also has a vibrant nightlife scene. The National Congress is based in this city, whose metropolitan area is the second largest in all of Chile. Lately its road system has been improved, and its metro is expanding. An underground portion passes through Viña del Mar. There has been a bit of a population boom in Valparaíso in the last decade. A city by the sea lush with flowers and greenery, Viña del Mar is Chile's tourist capital, with its splendid Pacific beaches and pleasant Mediterranean climate. It is conveniently close to Santiago. Viña del Mar's beaches are known for their fine sands and pristine waters. Acapulco, Mirasol, Los Marineros, Mirador Cochoa and La Roca de Lobos Marinos are some of the best known beaches. Reñaca is perhaps the trendiest resort, with plenty of shopping centres, discos, and restaurants. Viña del Mar experiences rain only during the mild winter, from April to September, and the summers (from October to March) are temperate. This lovely mild weather is responsible for the lush growth of all kinds of vegetation. The city is built on a grid system. Big modern buildings dominate its waterfront, while along the inner streets of the city are many charming old homes. The city has retained much of its traditional character. The pace of life is languorous, with some shops still closing for siesta. However, this is hardly an indicator of how interesting the area actually is. There are many museums and art galleries, castles and palaces, theatres, and parks all over the city. The bustling Avenida Valparaíso is the city's main commercial district. The north of the city is full of restaurants of all kinds, many serving international and criollo cuisine. The very isolated volcanic Polynesian Easter Island can be reached from mainland Chile by plane. Administratively, it is part of the Valparaíso region. It is famed for its hundreds of mysterious giant standing heads and other archeological sites, and is a UNESCO World-heritage Site. Its inhabitants, the Rapa Nui, have just about survived a nightmarish history of environmental degradation, followed by internal wars. They were already a shadow of their former selves when the whites arrived. Later, slave-traders attacks, followed by smallpox epidemics brought by missionaries and commercial exploitation, at one point reduced their population to less than 100. There are now traditional music festivals, but obviously much traditional Rapa Nui knowledge has been lost. There are also venues for modern entertainment on the island, with a few clubs in the town of Hanga Roa. Outdoor sports are popular. There are two white sand beaches. Anakena Beach, in the north, is a popular place for bodysurfing. The other beach is beautiful and secluded, but difficult to access. There are scuba diving and snorkeling facilities. Hiking and cave exploring are also other popular. The province and commune includes the Islas Salas y Gómez to the east of Easter Island.